How many times in life people come and leave you for good and then again at some point of time you come across them and your feelings are in a dilemma. 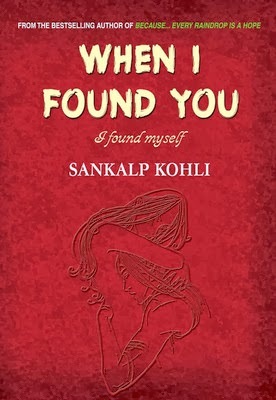 Author Sankalp Kohli in his second book "When I Found You, I Found Myself" has something to offer which is rarely spoken about. So has he narrated this newer tale convincingly? Let's find out. They first met when they were just twelve and then they kept meeting again and again, each time wanting to confess their feelings for each other but it never came to such a pass for Tiya and Aarav. Falling apart and bowing down to the miseries of a broken family and a daunting past, at 24, they decided to move on. But life pulled out one trick after another to bring them back to each other and give one last chance to do what they couldn't do in the past twelve years. A choice had to be made and there was no going back. Could they learn from the echoing footsteps of their parents and speak their heart out or the fear of saying the unsaid killed it once again for them? Did their time to fall in love come or like always, they met, greeted and departed to part forever? First look at the title and the cover and the title is mesmerizing. The soothing touch of the title is like honey on lips. The cover image is quite dull in comparison to the title. It could have been a much better cover image. The blurb talks about two people and their lives and what is there in offering for them when they go on to lead their lives in their own chosen manner. It's a very good blurb. It's short and precise. The story is about Tiya & Aarav. Their friendship in school culminating slowly and steadily through time. But there are a lot of other pleasantries offered to them and they are thrown off track completely. Aaarav tries to move on so does Tiya but life gives them another shot at redemption. But it comes at a price. So will they ever be able to get together? Will Aarav lose Tiya again? Will their be peace? That's what the story is all about. The story with it's poetic verses and different narration for both the people makes it a coming of age story. The thought process captured with the help of emotions and turmoils and joys and sorrows makes it a very heavy kind of a book. It tends to dig deeper in to the human emotions and journey of life through various phases. The loss, the gain and love all of them have been synced and woven in to the story perfectly. The slowness of the story and the limited number of characters in the book compels the readers to go through the pages with all the time in the world. The downside of the book is the second half which gets duller. The end is abrupt and could have been polished in a better manner. The book could have had a bit more and an extended end would have made it a perfect novel. The book has captured human emotions in a wider aspect and made things tricky at times for the readers. The humming narration and the slowness has to be absorbed. It might get a bit off color towards the end but will hold on to the theme of the story completely. It's a fresh aspect to a love story, but still it ain't a love story.